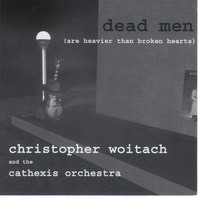 Dead Men (are heavier than broken hearts) is a musical tribute to the great detective novelist Raymond Chandler. This is not a "film noir" score, it's a collection of modern jazz compositions by Christopher Woitach about, and using phrases from, Raymond Chandler's books. Included are vocal and instrumental compositions reflecting the many moods of Chandler's writing, played and sung by some of the Pacific Northwest's most creative musicians. The compositions utilize various techniques including alphabet/pitch substitution, Fibonacci sequence used in various ways, contour agacency series, fugue, canon, and, of course, free improvisation.